Well, it's almost exactly a year since I kicked off what I called 'The Trimsos Project' - and now I can claim to have achieved my initial goal. 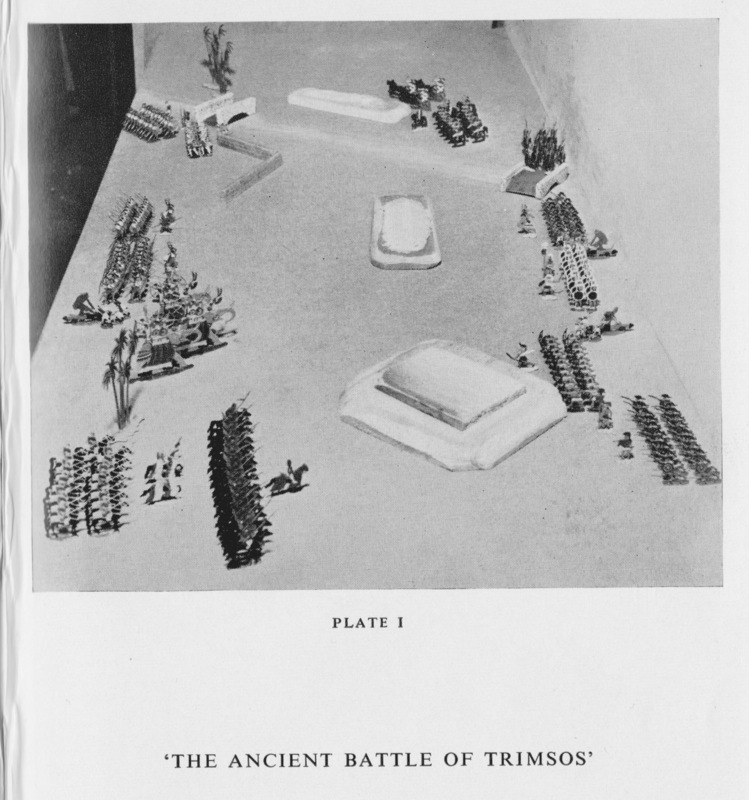 I have the armies and terrain I need to stage a full-blooded re-fight of Donald Featherstone's 'Battle of Trimsos' from 1962, along with some rules that I have developed myself from the Featherstonian originals. The rules are still a work in progress, but they are at least at the stage where you can fight a decent battle with them. This I have now done, staging a re-fight as a solo game the other week, then using my old gaming buddy Paul as a guinea pig for a second game this week. If by any chance readers are interested in how things have developed over the preceding months, older posts covering the project can be found here, here, or here. As you might have guessed, things took rather longer than I first expected (I had hoped to get to my current position by late summer), but my worst fears of partial or total failure have not been realised. 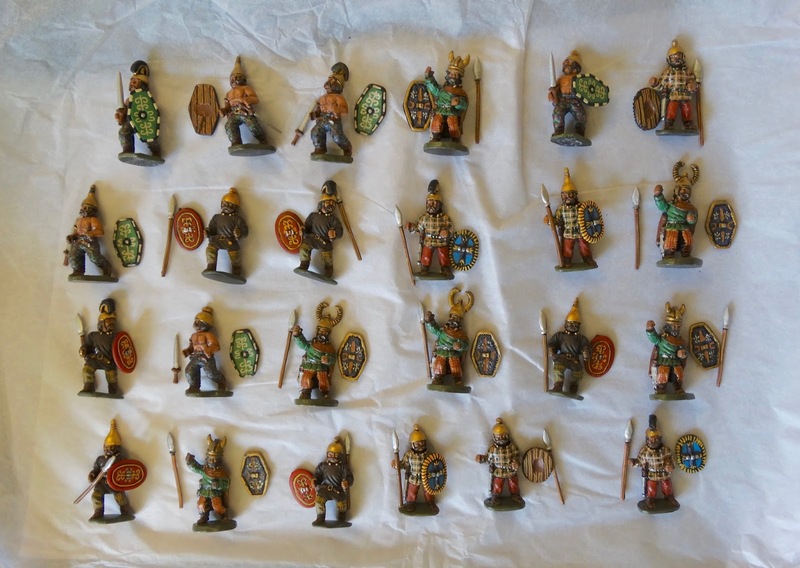 Getting into the complex world of Ancient Wargaming turned out to be a thoroughly absorbing journey which has involved much very enjoyable reading and many hours of modelling. 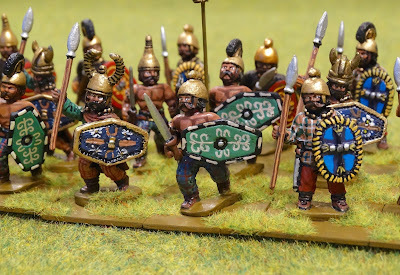 The latter was really rather fun to start with, and although the novelty of turning out units of ancient figures has rather palled recently, overall the painting experience has been good. Now the (self-imposed) pressure is off, I can proceed to expand my armies at a suitably leisurely rate. 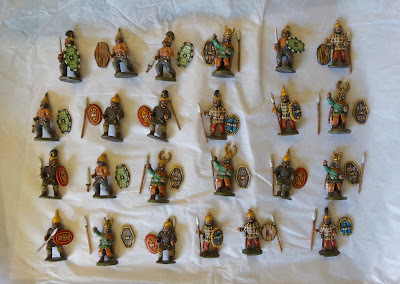 And when I say expand, I am not going to do anything silly like aim for a large ancients collection. An extra half-a-dozen or so units should suffice to allow plenty of interesting games in the future. 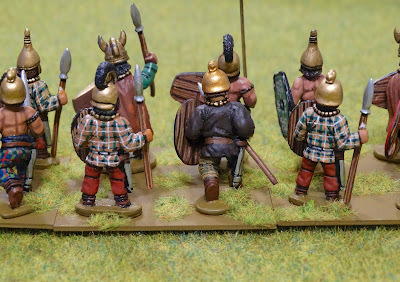 Before continuing with the story of my first Trimsos battles, I should acknowledge that the inspiration for the project lies with my near-neighbour Stuart Asquith. His original invitation to re-create Trimsos over a year ago sparked my interest both in the original game, and also in a concept of ancient wargaming that avoided getting into a specific period but rather involved the creation of imaginary, Tony Bath-style armies that could be composed of any ancient figures you liked. 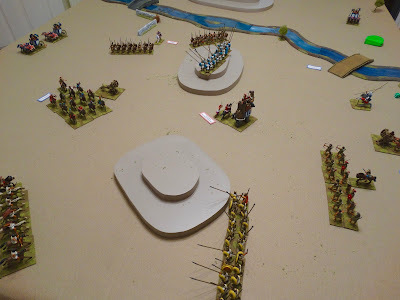 That original game with Stuart, where Ancient Britons shared the table with New Kingdom Egyptians and Roman legionaries, opened my eyes to a more light-hearted approach to wargaming that offered me a refreshing change, compared to the rather serious task of getting the historical details of the Seven Years War straightened out for my Honours of War rules and associated armies. 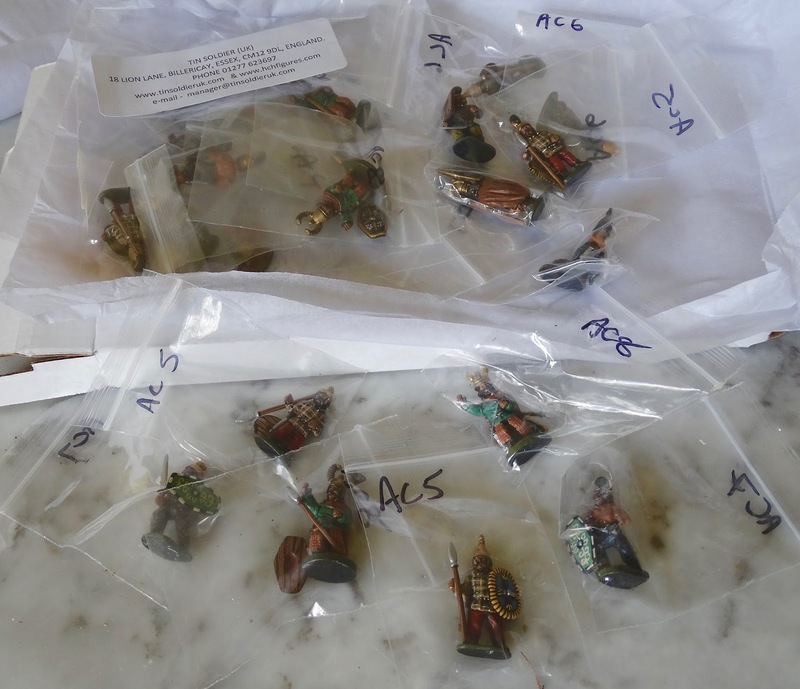 Whilst the ancient rules I have been developing ended up a long way from Mr Featherstone's, it was that easy-going concept of collecting whatever ancient figures took your fancy that has really kept the project alive. The previous posts already flagged up will suffice to give an idea of how I conceived and then worked through the project. Here I will simply show how I finally put the game on, giving an idea of what I kept from the original and what I altered. The original 6' x 3' table was extended to 6' x 5', which would make for a less cramped set-up and allow the use of full moves, rather than the half moves used in the original game. My table can be seen in the first photo below. I picked an S&A Scenics 'Dried Earth' felt cloth as the basic playing surface, which cost £34 for an 8' x 6' cloth. I used the Flames of War river I already had, and created the three contoured hills from 18mm MDF. This was a particularly fun part of the project, involving the purchase of a cheap electric jigsaw for cutting out the shapes, which worked like a dream. These were then painted in emulsion and varnished. I did buy some palm trees as well, but in the end substituted some small model railway trees I already had, which better suggested the arid but not entirely desert landscape I was trying to create. A handful of light green scenic scatter randomly sown across the landscape completed the picture. The structure of the two armies followed the original orders of battle quite closely. However, I dreamed up two new countries for my combat, not wanting to follow Tony Bath too slavishly, and so it was the armies of Paphlagonia (Hyperborea) and Latium (Hyrkania) which took the field. The back story for these two imaginary countries is limited - I imagine Paphlagonia to be the possessor of a modest Anatolian 'empire', which the Italian-based Kingdom of Latium covets for its own. The initial battles between these armies will imagine an invasion of Anatolia by Latium at an unspecified point in ancient history. 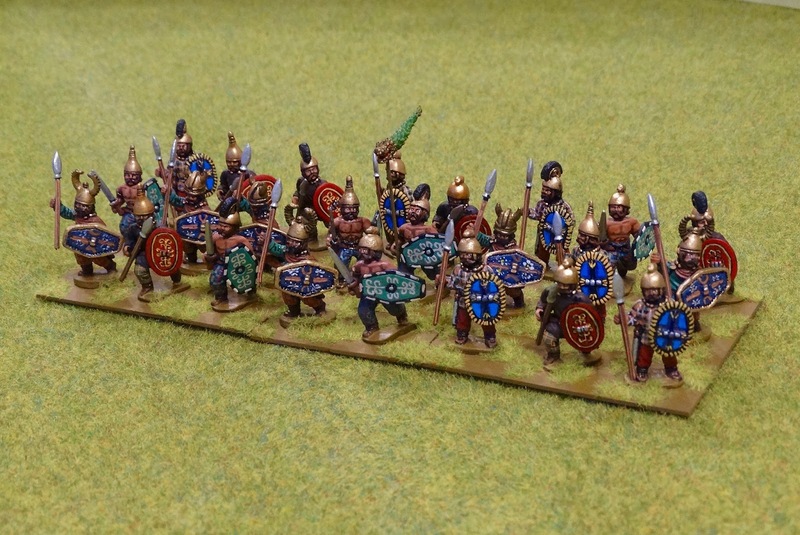 The only slight innovation here was the replacement of the 3 original heavy infantry regiments (1st and 2nd Gwalur Infantry and 1st Thurn Infantry) by 2 larger units, which would together have the same number of figures as the 3 regiments of heavy infantry in the opposing Army of Latium. This was purely to add a little personal flavour. Note that both armies use slightly smaller units than those in the 1962 battle. 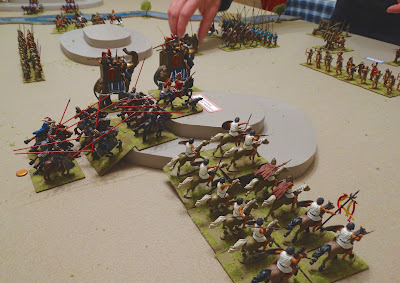 This was simply to make creating the armies a little quicker for a gamer with limited painting abilities. Both sides had two sub-generals to increase the command possibilities. The most important of these was to make the River Trimsos crossable. 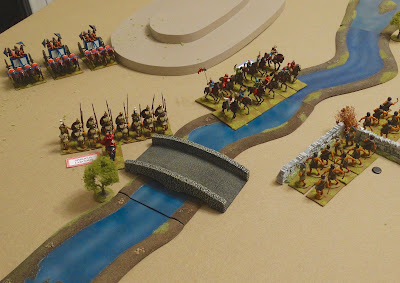 This meant that the Paphlagonian forces west of the river were not cut off from their comrades, with the unwinnable task of crossing New Bridge as their only offensive option. I felt this was acceptable as the area was described in the book as 'the arid region around the River Trimsos', which suggested a river of limited flow which might be relatively easy to cross. The change in table size has already been mentioned. The final arrangement of the terrain had to be a compromise between the original map and the photos of the original battle, as these two differed. I favoured the terrain as shown in the photos, as this gave enough space east of the River Trimsos for the army of Paphlagonia to be deployed as in the original game. For victory conditions, my rules use the time-honoured technique of defeat following the loss of half of one's units. With each elephant, chariot or war engine counting as a single unit, this gave each army 10 units, so the first to lose five would suffer defeat. So, two games were fought to formally complete this initial phase of the project, firstly a solo one to iron out any gross problems followed by a second 'proper' game with two players. I had envisaged doing a blow-by-blow account of the two-player battle, mimicking the original book, but readers will be relieved to know they will not have to work their way though such a trial. In the end, creating such an account was simply too much work, and would involve extensive explanations of the rules to go with it. Suffice to say the games were very enjoyable. 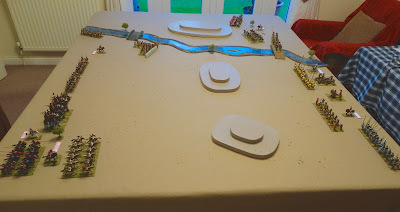 It was of course particularly satisfying to see the battlefield finally set out after a year's work, and I was happy with the look of the thing as well as how the games played. The solo game saw a winning draw by Latium (both sides lost their 5 units on the same turn, but Paphlagonia had lost a 6th unit in addition to the basic 5), whilst the second battle saw Latium (controlled by myself) given a thorough beating, ending up with seven units lost to Paphlagonia's one! Thus, it would seem the scenario is reasonably well balanced and can go either way. The photos below give a further flavour of how the figures and terrain looked. 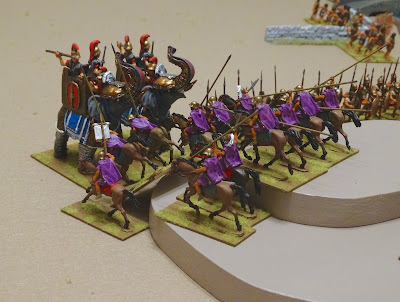 Solo game - the Paphlagonian Companion cavalry set about the enemy's elephants. Solo game - combat around New Bridge. Two player game - the doomed cavalry and elephants of Latium advance over and around The Pimple. into the enemy's rear. The Blue Shields triumphantly occupy the peak of Rat Hill. I have already started work on some new troops, commencing with a couple of units of light javelin men and a unit of Celtic Warband (of which more in a new post to follow shortly). 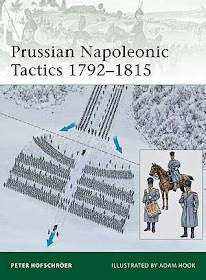 Then it will be time to move away from the Trimsos scenario and fight some new battles. I'll be sure to keep you informed.